Creating an assignment in a Class Notebook will distribute it to all the students in that class. The assignment and its due date will also sync automatically with your Learning Management System (LMS) or Student Information System (SIS) after you've connected your Class Notebook to the LMS or SIS. 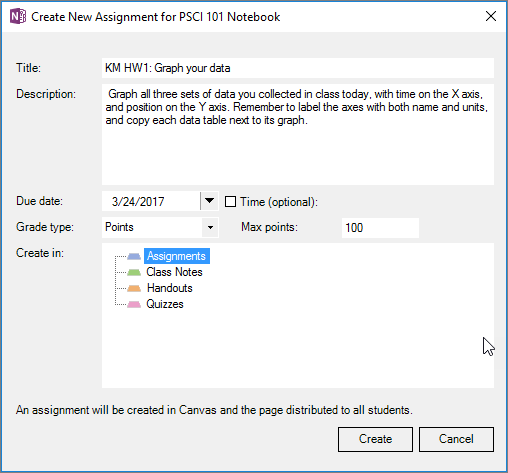 Note: If you haven't yet, connect your LMS or SIS to Class Notebook before creating assignments. Until you connect them, the Create Assignment button will be grayed out. Open OneNote on your desktop. Select your Class Notebook by name, and add the assignment to your notebook’s Content Library or Collaboration Space. 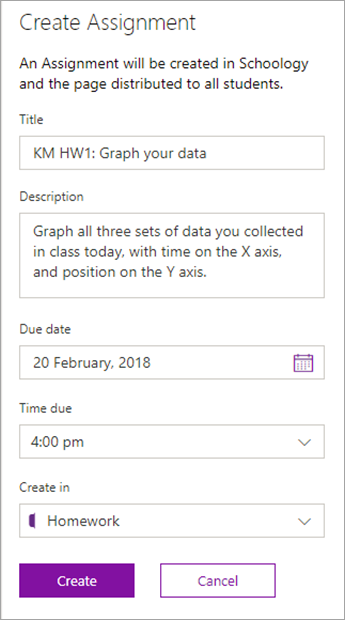 On the page you want to distribute, select Class Notebook in the OneNote ribbon, then select Create Assignment. Review and edit the assignment’s title and description, and choose a due date and time (optional). Select the Class Notebook section you want students to find the assignment in. For example: Assignments. The new assignment will now appear in student notebooks and in your LMS or SIS. Add the assignment as a new page to your notebook’s Content Library or Collaboration Space. From the page you want to distribute, select Class Notebook in the OneNote ribbon, then select Create Assignment. Fill in the assignment’s title and description, and choose a due date and time (optional). Select the Class Notebook section you want students to find the assignment in. For example: Homework. Assignment created successfully will appear when the assignment has completed distributing to students. The assignment will also sync to your LMS or SIS.